Meebo will launch a “first of its kind” check-in system for the Web , using a new browser bar extension called the Meebo MiniBar. 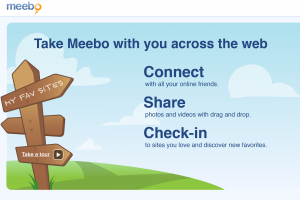 Users will be able to “share” their location by checking in through Meebo when they visit a particular Website. Meebo users will have the option to build up a Meebo social graph by friending and following other users. Meebo started as a browser based multi instant messaging system. They got millions of users quickly, expanded to mobile and position also as a social network. Meebo currently reaches 180 million unique users monthly. They just closed another $25M funding, "as content sharing gets hotter" as they say. Of course, there have been other "check-in systems for the web". Every system listed here checks or checked in users on web sites where they meet other users. But this is the first company to launch a browser bar web check-in at this scale.